A panel in the control room for Lewis Research Center's Unitary Plan Wind Tunnel. 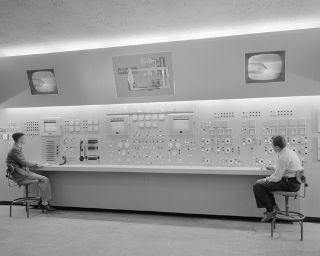 In this historical photo from the U.S. space agency, one of three control panels in the control room of the Lewis Unitary Plan Wind Tunnel is pictured on Oct. 17, 1955. The tunnel model (top center) shows position of the valves that control the operating cycle of the tunnel. The TV monitor screens can be connected to any of 3 closed-circuit TV cameras used to monitor tunnel components.